The federal government defines the Producer Price Index (PPI) as "the average change over time in the selling prices received by domestic producers for their output." With help from the Federal Reserve’s massive inflationary policies, the PPI has climbed even as the economy began to fall in 2008-09. All the while, the financial media persisted with stories of an economic recovery. EWI analysts offer an independent perspective. The New York Times declares, "Economic Gloom Starting to Lift." Corporate America, however, is not so sure. 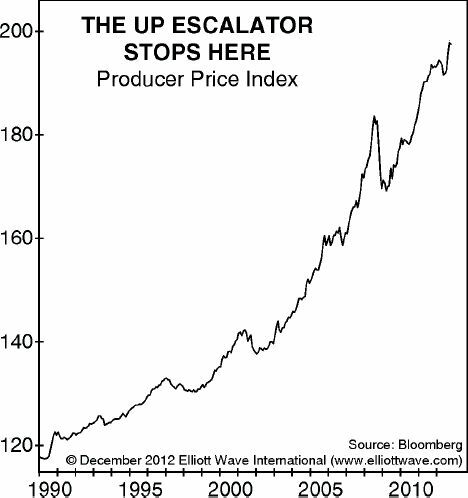 This chart of producer prices [wave labels removed] probably illustrates why. After years of largely uninterrupted growth, the Producer Price Index appears to be on the cusp of a critical reversal that should turn into a steady decline in wholesale prices. The latest Financial Forecast published Dec. 7, and the latest evidence reinforces the message of the chart’s title. The PPI elevator has already descended to a lower floor. The Labor Department said its seasonally adjusted producer price index slipped 0.8 percent last month, the second straight decline. November’s drop in wholesale prices was the sharpest since May. The Producer Price Index decline is happening in tandem with a notable reversal in consumer sentiment. The Thomson Reuters/University of Michigan’s preliminary reading of the overall index on consumer sentiment plunged to 74.5 in early December, the lowest level since August. It was far below November’s figure of 82.7. The Federal Reserve’s machinations — which includes the Dec. 12 announcement of $45-billion in monthly Treasury bond purchases — will not stave off a developing deflationary trend. In the second edition of Conquer the Crash (p. 114), Robert Prechter describes what generally happens, depending on the position of the Elliott waves, near the end of the Kondratieff cycle. Near the end of the cycle, the rates of change in business activity and inflation slip to zero. When they fall below zero, deflation is in force. As liquidity contracts, commodity prices fall more rapidly, and prices for stocks, wages and wholesale and retail goods join in the decline. When deflation ends and prices reach bottom, the cycle begins again. How much farther does the economic cycle have to go before it reaches the bottom? Is the bottom even in sight? The answers can be found in Prechter’s Conquer the Crash and it can even help you prepare for the coming changes. For a limited time, you can get part of Conquer the Crash for free. See below for more details. This free, 42-page report can help you prepare for your financial future. You’ll get valuable lessons on what to do with your pension plan, what to do if you run a business, how to handle calling in loans and paying off debt and so much more. This article was syndicated by Elliott Wave International and was originally published under the headline Two Signs That Deflation is Far From Over. EWI is the world’s largest market forecasting firm. Its staff of full-time analysts led by Chartered Market Technician Robert Prechter provides 24-hour-a-day market analysis to institutional and private investors around the world.